Here at Volkswagen Lee’s Summit, we’d like to facilitate a better understanding of the VW Jetta and its dashboard symbols amongst our customers in Olathe, Mission, Overland Park, North Town, and Lee’s Summit. After all, taking advantage of these is one of the best ways to keep your vehicle healthy. Refer to our Volkswagen Jetta Dashboard Symbols guide to learn more. On the Volkswagen Jetta, there are traditionally two classes of dashboard symbols and warning lights.First, you’ve got the red lights, which are the most serious. These mean that you shouldn’t drive until you’ve had a professional maintenance appointment. Then, there are the yellow lights, which aren’t quite as time-sensitive. You still want to get it checked out, but you’re not quite at DEFCON 1 just yet. Oil Pressure Warning. This is a red-colored symbol that looks like an oil can with a drop coming out of it. Improper oil pressure is a serious issue, and you should schedule your service appointment immediately. ABS/Brake System Malfunction. This icon looks like a red exclamation point within a circle. Your VW Jetta’s anti-lock brake system prevents your brakes from locking up when you need them most. Therefore, if this light turns on, you should stop driving and pull over as soon as it’s safe—then, reach out to us. Hood Open. Don’t drive with your hood open. This warning looks just like that, so exit your vehicle and close the hood as soon as you see it. However, if the issue persists, we can help. Charging System Failure. Your VW charging system is responsible for a bunch of critical functions and systems, from starting your car to running your audio system. If there’s a charging system failure, an icon that looks like a bright red battery (complete with positive and negative symbols) will alert you. Tire Pressure Monitoring System. This looks like an exclamation point within a tire, and it’s typically yellow. Any vehicles produced for American roads are required to come with a TPMS, so heed it well. Coolant Warning. If your coolant level is low (or, similarly, if your coolant temperature is high), your Volkswagen will alert you with an icon that looks like a thermometer that’s dipping into water. You ought to check your coolant manually, and then reach out to a professional if it’s actually too low. 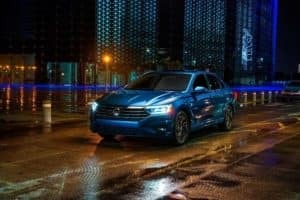 These are some of the most critical Volkswagen Jetta dashboard lights and warning icons—the red ones, as we explained above. Yet, there are some other lights that you should still keep an eye out for, even if they come on in yellow: Airbag Warning, Electric Power Control, Bulb Failure, Low Fuel Level, Automatic Transmission Malfunction, Washer Fluid Low, etc. Don’t hesitate to drop us a line if you have any questions. If you’re noticing one of these lights on your dashboard (or, if you’re having any other sorts of issues with your Volkswagen Jetta), you can set up a service appointment on our website. Just fill out a form, call us, or stop by from Lee’s Summit, North Town, Overland Park, Mission, Olathe, or the rest of MO or KS.